Genealogist for the Clan MacFarlane Worldwide, Inc. The home of the MacFarlane clan is the parish of Arrochar at the head of Loch Lomond and Loch Long at the beginning of the western Highlands. This area was granted by feudal charter to one of the younger sons of the second earl of Lennox in 1286. The history of this exchange is found in an old Celtic genealogy of Duncan, the eighth Earl of Lennox, who was executed in 1425. It goes something like this: the first Earl of Lennox was Alwyn, followed by his son, also named Alwyn, in 1199 as the second Earl. This Alwyn had many sons, the eldest being Maldouen, the third Earl, who granted his younger brother, Gilchrist, the lands of Arrochar. Gilchrist’s son Malduin was father to Parlan, which is a name that has been linked to Partholon, “Spirit of the Sea Waves,” from Irish mythology. In 1344, Parlan’s son, Malcolm MacPharlain, renewed the charter for the lands of Arrochar from Donald, the 6th Earl of Lennox. And that is the beginning of the Clan MacFarlane. When the direct line of heirs to the Earl of Lennox’s title died out in 1425, the MacFarlane chief was the closest blood line; however, the MacFarlanes lost their bid to be recognized in that position to John Stuart of Darnley who prevailed as the 9th Earl of Lennox in 1488. Although the MacFarlanes almost lost everything, a marriage union saved the day, lands and charter were returned to the MacFarlane chief and the MacFarlanes went on to support the Earl’s Stuart line through thick and thin. On Henry VIII’s death in 1547, many Scots saw an opportunity to recognize their five year old Queen Mary Stuart as the legitimate heir to the throne of England as well as Scotland. Duncan, the 13th MacFarlane chief, lost his life at the Battle of Pinkie when the forces of Henry’s son, Edward VI, invaded Scotland and defeated this effort. Andrew was Chief from 1547, when he was only three, until 1612. He built a second castle stronghold on the island Eilean I Vow in Loch Lomond in 1577 that King James VI visited at some point. The ruins of this castle can still be seen today. Years later, William Wordsworth wrote a poem called “The Brownie’s Cell” inspired by a visit to this island and ruin in 1814. Still standing is an underground small room that is home to spiders and an occasional visitor. These years were filled with violence and vendettas, feuds and thievery. The MacFarlanes supplemented their income by making frequent cattle raids on their neighbors by the light of the full moon, which subsequently became known as “MacFarlane’s lantern.” Andrew, the 12th Chief, is the supposed author of the song “Thogail nam bo theid sinn” (To Lift the Cows We Shall Go) which was considered the gathering tune of the MacFarlanes when they set out to raid. The most well known MacFarlane story is the feud between the MacFarlanes and the Colquhouns who lived in the lowland area of Luss. Competition seems to have turned murderous with the death of Humphrey MacFarlane at the hands of Sir Humphrey Colquhoun of Luss. What ever provoked this is unknown, but it led to a series of cattle-rustling raids in 1590. Then a story emerges of a love affair between the wife of John MacFarlane (heir to the chieftainship) and Sir Humphrey Colquhoun. John, with help from the MacGregors, followed the couple, chased Sir Humphrey to his stronghold, set it on fire, killed him and then mutilated his body. The story continues with his body parts being served on a platter to his unfaithful wife, followed by their divorce. Although subsequent information points to his murder by one of his own relations, the love-affair seems to be an authentic cause for the raid. The raids continued, this time the MacFarlanes were helping the MacGregors against the Culquhouns. It seems the Culquhouns were more knowledgeable of courts and public relations, because their complaints against the MacGregors and MacFarlanes were more kindly favored by authorities. The MacGregors were proscribed and the MacFarlanes were outlawed in 1608, although that must have been quickly rescinded, because the MacFarlanes were back in court by 1610. The Duke of Lennox, Ludovic Stewart, was from Stirling, near Lennoxton in Scotland. He was considered one of the chief Undertakers, and was granted 3000 acres in the Portlough precinct of County Donegal. That area lies on the west side of the River Foyle, and today is part of Ireland proper, not the English possession of Northern Ireland. However, it abuts County Tyrone in Northern Ireland, and is part of Ulster. The English Civil War led to the execution of Charles I in 1649. Many in Scotland were supporters of Charles, the Stuart son of James VI, and the Cavaliers, and that included the MacFarlanes. Although it was the Scottish protests against Charles enforcing Anglican practices on the Scottish Presbyterians that started the problems in England, Charles was a Stuart and the MacFarlanes chose to support him over Cromwell and Parliament, especially after Charles was beheaded. 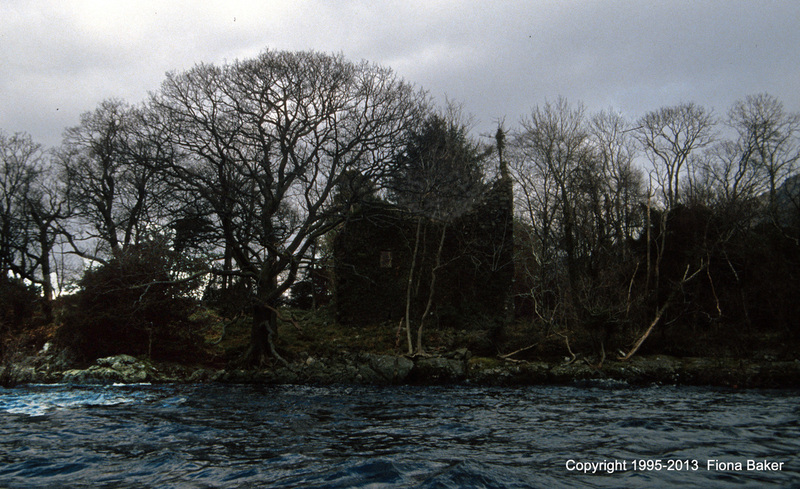 As punishment for that support, Cromwell’s troops destroyed the oldest of the MacFarlane castles-the one situated on Inveruglas in Loch Lomond. This castle was probably built in the 1400s, and served as the main stronghold until it was destroyed around 1654. In 1679, MacFarlanes fought for the Duke of Monmouth, Charles II’s illegitimate son, in his bid for the throne at the Battle of Bothwell Bridge. It was, however, unsuccessful. John was succeeded by his brother Andrew, in 1679; then followed Andrew’s son, John, in 1685 as the 19th Chief. He sided with the takeover of the English throne by William & Mary, Protestants, as opposed to the Catholic James II who was deposed. John was appointed Colonel of a regiment of foot-soldiers in 1689 and seems to be the last of the chiefs engaged in war. In 1697, he built a residence in Arrochar; the dedication stone is still visible on the present house, now a hotel. The 20th Chief was Walter MacFarlane from 1705 till 1767. He was known as a great scholar and antiquarian who devoted his life to collecting, translating, and preserving manuscripts of Scotland’s past. It is certain he did not lead any MacFarlanes into the battles fought in 1715 and 1745 to seat the Stuart pretenders in exile in France on the throne in England. There are conflicting reports as to MacFarlane participation in those fruitless adventures; however, if some MacFarlanes did participate, it was not under their Chief’s command. His lands were not confiscated and he was not outlawed or sent into exile. The story of a Sir John McFarland, exiled chief who fled to America in 1746 and became known as “Old Scotland John” does not fit with the facts. The variation of spelling of MacFarlane to McFarland, and other variations, makes no difference, but it can give a clue about when, and from where, immigration took place. Even in Scotland, spelling changed over time and place. In the 1500s and 1600s you can find documents using the spelling Makfarland. This spelling was often used in Ireland and eventually became the dominant spelling there. However, in early America, we also see McFarlin, McFarlan, and Makfarland, all within the same document and referring to members of the same family. Back in Scotland, the “d” was dropped and the “lane” and the “lan” became more common; therefore, later immigrants used the MacFarlane spelling more often. MacFarlane, James. History of Clan MacFarlane. Clan MacFarlane Society. Glasgow, Scotland. 1922. McCain, Barry R. “A Short History of the Laggan Redshanks, 1569-1630” Ulster Heritage Publishing, 2012.